In Egyptian mythology, the various deities not only ruled specific departments of life but actually embodied these concepts as well. What does this mean? Well, in other words, Nefertum , Lord of Perfume, not only ruled and sponsored the fragrant arts but also actually embodied their product. He not only ruled the process, at its finest expression, he could be the result. Heka was not only god of magic but also the embodiment of magic as well. Similarly, Hathor was the goddess of beauty and sacred sponsor of the cosmetic arts but simultaneously their living embodiment too. It is difficult to consider the Egyptian vision and concept of beauty without also considering the roles played by this prominent goddess. Hathor is among the most ancient of the Egyptian deities . She figures prominently in the creation saga featuring Ra . Although Isis, who shared or adopted many of her attributes, would eventually eclipse her in popularity, Hathor would remain an important deity for as long as worship of the traditional Egyptian gods was legal and permitted. Even today, she continues to be spiritually significant both for those Westerners who find spiritual inspiration in ancient Egyptian religion and also for local Egyptian women who still seek cures, fertility and protection at the remains of her shrines. Hathor is a constant presence in the history of Egypt. Hathor was the matron and embodiment of what were considered the pleasures of life 5,000 years ago- and which for many, remain so even today: joy, love, romance, fecundity, dance, music, alcohol and perfume. A deity of women, she ruled anything having to do with the female gender. Yet although she was intrinsically connected to the female of the species, Hathor cannot be considered only a women’s deity. She also had a large and devoted following among men. As Lady of Malachite, Lady of Turquoise, Hathor was also connected to metal. Holding spiritual dominion over the Sinai Peninsula, she was responsible for the success and well being of the mines in that area. Apparently Hathor was as intensely worshipped by male miners and soldiers, as she was by women in childbirth or young girls desirous of husbands. Both genders were able to recognize the sacred divine within her seductively vibrant joyous beauty. Hathor may be occasionally fierce and terrible; she is never, however, unattractive. Lest one think her imagery is limited, it is interesting to note that Hathor traditionally takes more forms than perhaps any other ancient Egyptian deity, most of whom are limited to only one or two shapes. In terms of imagery, she is perhaps the most fluid of all of the Egyptian deities, rivaled only by the controversial Seth, among whose little-known positive attributes include the providing of powerful love magic. Thus, Bastet appears either as a cat or as a woman with a cat’s head, that’s it. Hathor, the Great One of Many Names, seemingly takes innumerable shapes: woman, goose, cat, lion, malachite, sycamore fig, to name only a few. Perhaps Hathor’s most famous manifestation is as a cow. This bovine imagery remains most consistent. Even when appearing as a woman, she often sports a cow’s head or at least a pair of cow ears, indicating perhaps that no matter how she appears, the nourishing, generosity of the cow is always readily available under the surface. Hathor embodies abundance in life, whether abundance of beauty, wealth, security or justice. Prominent among common people and the royal state religion, Hathor is frequently depicted suckling the pharaoh, whether in the guise of a cow or as a sycamore fig, a tree that exudes a white milky substance. When she is depicted as entirely a cow, she can be distinguished from run-of-the-mill bovines by her exquisitely made-up eyes. Malachite, mined in Hathor’s province of Sinai, was ground into eye make up. Thus one not only worshipped Hathor through the act of embellishing the eye, one also wore her essence upon one’s body. Although one cannot draw definitive parallels as we lack definitive records, one can recognize a merging of physical and spiritual goals, akin to the manner in which painting henna upon the body transcends mere body art for a devout Hindu woman. The ritual ideally brings actual physical connection with the divine presence of the good goddess Laksmi, embodied in henna. Laksmi, quite similarly to Hathor, rules joyousness, abundance and the beauty and vitality of women, the gracious acceptance of the pleasures of life. Thus Hathor was very likely not merely an abstract religious concept but a vital living component of everyday life. Eventually, Isis would borrow much of Hathor’s iconography and her functions, eventually even wearing her headdress. However, the two deities are not the same nor are they interchangeable. Isis is a being of tremendous complexity: there is tragedy inherent in her myth. Ultimately, Isis is the bereaved widow, the self-less, devoted single mother. For all Isis ‘ fame as the Mistress of Magic, she cannot avoid pain, grief and desolation. Her legend embodies both the noblest and the most hopeless aspects of human nature. Hathor, on the other hand, is the embodiment of success. She lacks the ambivalence Isis sometimes possesses. Instead Hathor has an absolute, laser-like focus. She may be joyous and benevolent or she may be single-mindedly vengeful towards spiritual transgressors, the enemies of her father. Unhappiness, ugliness, failure: all these are foreign to her, not a part of her being. Even in her most vengeful, dangerous aspect, Hathor takes the form of an elegant if fearsome lioness or the searing but beautiful solar eye. Hathor in her vengeful aspect is a consistently dangerous force; she cannot be appealed to via emotion. Her destructive rampage is ultimately stopped through a trick utilizing alcohol. Hathor was sponsor not only of miners and perfumers but also of brewers. Implicitly, it is only through her own force that she can be appeased and controlled. This is unlike Isis, who at the moment of Horus ‘s triumph suffers a pang of mercy and pity for Seth , his rival. Horus’s response is to cut off his mother’s head, which will ultimately be replaced by that of a cow- an echo of Hathor for whom boundaries are starkly clear, who has no mercy on her father’s enemies. Another parallel exists between Hathor and Isis. In general, the Egyptian gods and Egyptian religion did not travel. The ancient Egyptians were insular, not overly interested in importing or exporting deities. Eventually Isis would become the great exception, with temples in Rome, and throughout Europe, Africa and Asia, as far away as the British Isles. 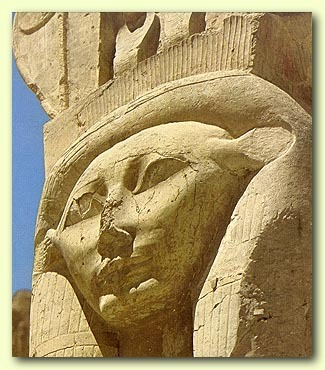 Hathor was her trailblazing predecessor. Beyond the traditional borders of Egypt and Nubia , Hathor was worshipped throughout Semitic West Asia, beloved particularly in the city of Byblos. She was also adored as far afield as what is modern Ethiopia, Somalia and Libya. The seed of what would be universally beloved within Isis also existed within Hathor. Their appeal transcends national or ethnic boundaries: Hathor perhaps embodies the wishes of those who long for life to be generously benevolent and abundant, while Isis embodies the hopes of those who wish for mercy and kindness. Hathor was associated with turquoise, malachite and the metals gold and copper. Her demeanor glows with consistent confidence and sunny, good health. Hers is a warm, sensual beauty not aloof or remote. Although she ruled the perfumer’s trade in general, Hathor was especially connected with the fragrance of myrrh, which was exceedingly precious to the ancient Egyptians and which on a spiritual level embodied the finest qualities of the feminine. The protector and sponsor of dancers, Hathor was associated with percussive music, in particular the sistrum. Her traditional votive offering was two mirrors, the better with which to see both her beauty and your own. Hathor’s image, specifically her head, was traditionally used to decorate sistrums and mirrors. Thus when gazing at one’s own reflection in the mirror, you would see Hathor looking back, from underneath one’s own face, serving as foundation and support, perhaps as role model and goal. This imagery was standard and ubiquitous, it also commonly decorates architectural columns, however one is forced to ask, how would one know it was Hathor? Usually by the cow ears but even more consistently by the hair-do. Hathor’s hair is dressed in so characteristic a fashion that the style now bears her name: archaeologists have dubbed it the “Hathor hair-do.” This style is utterly distinctive and perhaps surprisingly modern to our eyes. It is not the heavily bejeweled, elaborately braided hair so commonly depicted in other ancient Egyptian imagery. Rather it is simplicity in the extreme: a simple flip, often parted down the middle. The ‘do wouldn’t have looked at all out of place on a French or English mod girl pop singer of the early to mid ’60’s- a Marianne Faithfull perhaps or Francoise Hardy. It is a simple hairstyle, a hairstyle one can conceivably maintain by oneself, without extensive wigs, servants or leisure time. It is very much an equalizing hairstyle. Ironically, then, it is a hairstyle most commonly seen in the depiction of deities, especially beautiful love goddesses, perhaps demonstrating the intensity of their self-confidence. While other ancient Egyptian hairstyles are instantly recognizable even today as solely Egyptian, the Hathor hair-do seems to have set an international style, in particular traveling all over the Middle East. Other goddesses are depicted wearing this style, in fact it seems to have become the goddess hairstyle, favored by all the most fashionable deities. In Mesopotamia, the beautiful and stylish, ever youthful if fierce, Ishtar dresses her hair this way. So do the beautiful Western Semitic love and war goddesses, Anat and Astarte , who would eventually achieve great popularity in ancient Egypt, perhaps the only foreign deities to do so. They would become incorporated into Egyptian mythology, serving as the designated consolation prize brides for Seth, in the face-saving compromise that concludes his loss to Horus. Anat and Astarte, the ancient equivalent of hot foreign babes, of course wear only the most stylish of hairdos. Technically, we have no way of actually knowing where this hair-do originated or with whom. However, Hathor’s influence remains so consistent that no matter where an ancient goddess plaque is dug up, if she’s wearing that flip, she is automatically described as wearing the Hathor hair do. What the goddesses who wear this style have in common with Hathor beyond celestial beauty is a willingness to boldly battle on behalf of justice, their families and followers. Ishtar, Anat and Hathor: these images of beauty are not passive or vain but action-oriented brave women, perhaps so confident of their inherent beauty that elaborate adornment becomes only necessary for their own pleasure, not as a needed demonstration.